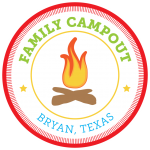 Due to the potential for inclement weather this weekend, Family Campout 2019, scheduled for Saturday, April 6 and Sunday, April 7 at Austin’s Colony Park in Bryan, has been cancelled. The event will not be rescheduled, but we hope to see you at Family Campout in April 2020. Those who have already registered and paid for the event will be contacted by members of Bryan Parks and Recreation about refunds. For more information, please contact Gwynne Shillings with Bryan Parks and Recreation at (979) 209-5518 or email her at gshillings@bryantx.gov.